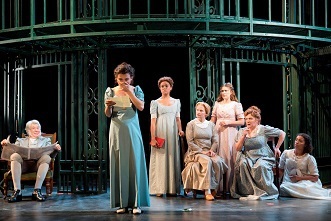 First performed in 2009, Simon Reade's adaptation of Jane Austen's classic Pride and Prejudice has since toured nationally and internationally. Presented by Regent's Park Theatre, the show comes to Birmingham Repertory Theatre midway through a UK tour. Which means there has been plenty of time for any rough spots to have been well polished in this production which plays The Rep until November 12. Indeed everything about it is polished - from the smooth scene changes created by a revolving set to the dramas and comedies going on within the Bennet household. Reade and director Deborah Bruce highlight the humour in the production so that even the most anguished moments – when Bennet daughter Lydia runs away with soldier Wickham – are eclipsed by Mrs Bennet's nervous fits. 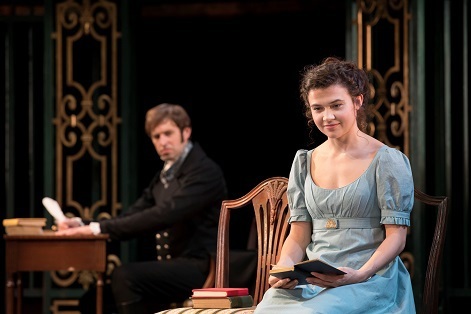 This keeps the audience interested and the story moving but it does risk the production losing some of the full characterisations and emotional depth of Austen's novel. Felicity Montagu gives a spirited performance as Mrs Bennet. Here is a woman whose sole purpose in life is to see all five of her daughters well married and the stress and strain of accomplishing this leaves her a nervous wreck. 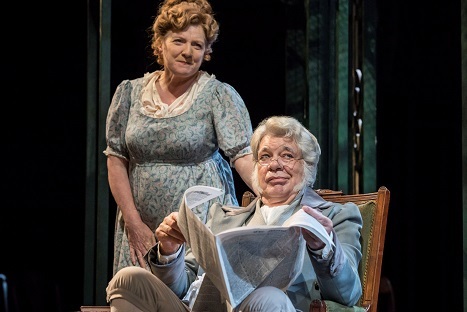 On the other hand her husband Mr Bennet, played with admirable insouciance by Matthew Kelly, resists all hysteria and retains common sense in the face of endless provocations. The master of understatement, a shrug of the shoulders or a raised eyebrow say it all. Steven Meo gives a great comic turn as the oily clergyman Mr Collins – his proposal to Elizabeth Bennet being a high point in the play. And Dona Croll is a grumpy Lady Catherine, a woman used to getting her own way. At the centre of the romance, Tafline Steen is a likeable Elizabeth and Benjamin Dilloway a suitably awkward Darcy. Max Jones' set easily sets the scene with the audience's imagination taking us into ballrooms, stately houses and grand gardens. Austen wrote Pride and Prejudice more than 200 years ago but productions like this one remind us why it has remained a classic. For details of the full tour see the website here. Having been regular Rep goers we have been priced out this year. Their loss Coventry Belgrade's gain.